Another star has been found with planets orbiting close to it. This star is very close at 12 light years away. Are the planets habitable? Are they like the Earth? Read on to learn more about the planets around Tau Ceti. A new study by the University of Hertfordshire reveals an exciting discovery. The Tau Ceti star located in the constellation Cetus — which looks something like a sea monster —has several planets orbiting around it. It’s size is smaller than our sun and it sits just 12 light years from Earth. After 14 years of research, researchers found the system has at least four planets. Two of the planets orbit within a habitable zone where liquid surface water may exist. The sizes of the planets vary and speculation suggests that one could compare to the size of Neptune. 1 How Did They Find The Planets? How Did They Find The Planets? Tau Ceti’s location close to Earth fuels scientists desire to research the system. Unfortunately they cannot use the typical detection system for locating planets. When a planets passes in front of a star, the light from the star dips which is called a transit. The length of the time in the dip allows them to determine the size of the star. With so much dust in the way, they have not seen any planets pass in front of Tau Ceti. Researchers have instead relied on the radial velocity or Doppler spectroscopy method. This method watches for minute wobbles as planets pull on their host star. Doppler spectroscopy detects periodic shifts in radial velocity by recording variations in the color of light from the host star. When a star moves towards Earth, its spectrum blueshifts, and then it redshifts when it moves away from Earth. 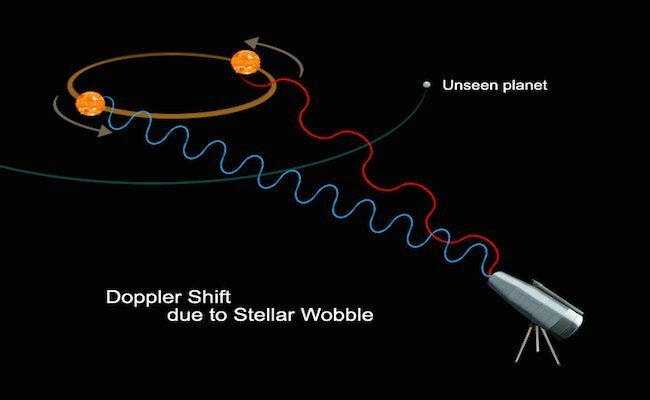 By analyzing these spectral shifts, astronomers can deduce the gravitational influence of extrasolar planets. Two times more massive than the Earth, the inner two planets orbit in a 20 and 49 day pattern. The massive outer two planets, four times as massive, orbit in 160 and 642 day patterns. Previous studies also suggest planets at 14, 35, and 94 days orbits. This would bring the total planet count to seven or more. The astronomers even spotted a potential planet in a 1,000 day orbit, but the signal was confusing and couldn’t be confirmed or rejected. Due to weak evidence surrounding the 14 and 35 orbiting planets, researchers only made announcements regarding the ones they found significance evidence for. The activity surrounding these planets may have come from Tau Ceti itself. With so much dust in the way, they will need to find a better way to pinpoint the existence of the three other potential planets. There’s also the issue of habitability. The 160-day planet is at the inner edge of the habitable zone — like Venus — while the 642-day planet is at the outer edge and could be a cold, Mars-temperature zone planet. Since the system is jam packed with debris, space rocks likely strike the planets 10 times more often than Earth gets hit. The other question remains as to whether another star may be close enough in proximity to affect the planets. One world might be too hot, another might be too cold. If their orbit is slightly eccentric they may be right for habitation. If the planets are rocky, that may be an indication of daily violent impacts. Scientists will continue to study Tau Ceti and its orbiting planets. Technology and space probes may provide the answers they seek. Only time will tell what is truly out there and if it can support life like here on Earth.